I guess I've never completed a painting so quickly. Well, that's acrylics for you. I started applying paint yesterday afternoon, and my Waterford Crystal vase is all done already. I've called it Bowl with Blue Pebbles. Unlike watercolours, acrylics dries really quickly, which means you don't need to wait for hours before you can paint the next section. 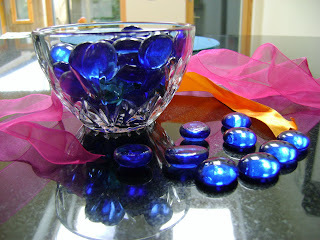 There were times last night and this afternoon when I thought it would be a disaster - the green was too green and dull, the blue pebbles didn't shine, the ribbons looked too solid, the vase reflection was the wrong shape (it still is!). But I love the colours of it. And it does look like a crystal vase with light shining through. I need to learn how to to put in details more accurately. I'm a bit slapdash, really. It's the same with my drawings - I don't do neat precise drawings. I don't have the patience. Maybe the good thing about watercolours is that the waiting forces me to think things through, plan the next step, choose the right colour, draw an exact shape... But it was fun to run with my instincts, even if it looked completely dull at times. The result is warm and dynamic, if I may say so myself! 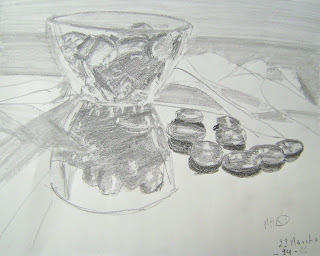 I've signed up for an art class starting at the end of April - we're going to do a still life in acrylics. Panic! I've done a bit of acrylics all right, and I know how to mix my paints, and I've done a few abstract projects, but I really don't know where to start when it comes to a proper painting. With watercolours, I do my photograph, then I trace it, then I mask the main shape and do the background, then I do the small details, etc. I have a formula that works. 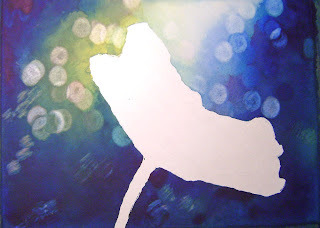 With acrylics, I don't know if I should start with the background, the foreground, is it best to layer or not... I'll be the new kid on the block in the class, and I want to get the most out of it. So, I'd better start practise. I've picked my subject - a lovely little Waterford vase that Kelly and Jim gave me the last time they were in Ireland, filled with blue glass pebbles, with a few ribbons in the background. 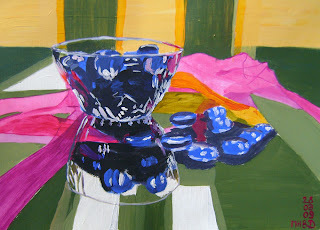 I'm interested in learning how to paint glass and I love the multiple reflections from the pebbles. And it's small enough to transport easily. So I'm going to try it out for the next few weeks. See if I can figure out an approach that works. I've already looked up on the web, but I haven't found anything of real use. 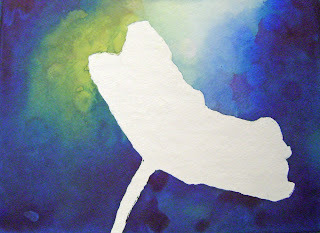 There are some interesting video classes, but the painting seems to emerge as if by magic, not much use to me. I took lots of pictures, and chose one. 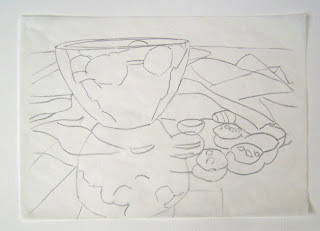 Then I started with a sketch (not a tracing! ), to get a feel for the lights and darks. Then I did a tracing. And now, I must look for inspiration as to what colours to pick and how to apply them! There are days when you're looking for something and you can't find it. And there are days when you just lift your head, and it's there. Our day in the Victoria&Albert museum in London was one of the latter. I had seen on their website that their exhibition of Japanese woodblock prints was ending on the day we arrived in London. So it was the first place we went to after we checked in to our hotel. There were plenty of prints, a few very good ones. 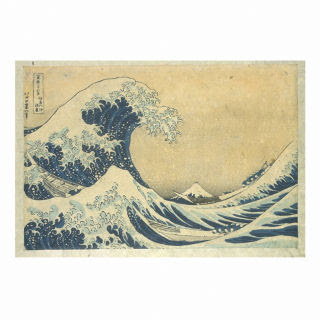 We had spent a bit of time in the 2nd room, looking at fans, and preliminary drawings, when I lifted my head and there it was, right in front of my eyes - Hokusai's Great Wave at Kanagawa. I had been to the Metropolitan Museum in New York twice in search for it, always to be disappointed as it was away on tour somewhere. I didn't expect to see it here in the V&A, so it felt even better to finally be face to face with it. Of course, it's so familiar that there was no major surprise. And it is small, but it is so gorgeous all the same. 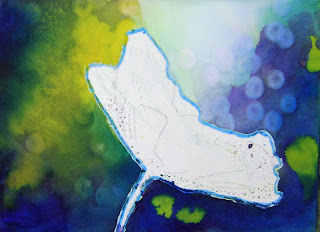 It's quite abstract, and the shades of blue are still perfect. There were 2 other views of Mount Fuji beside it, both very modern and yet so old. Unlike me, Brendan is very good at doing online research when it comes to purchasing electronic goods or booking hotels. He has the patience and tenacity to go through countless pages of reviews, comparing prices, assessing quality, and finding good locations. I just want to look at the pictures. He did it again for our stay in London last week - he found a bijou hotel on Sussex Gardens, in the Paddington area (very handy when you're getting the Heathrow Express from the airport). From the outside, the Shaftesbury Metropolis London Hyde Park hotel (a bit of a mouthful) looks like all the other small hotels on Sussex Gardens, a quiet road 5 minutes from Paddington station. When you step in, the reception area is bright and modern. 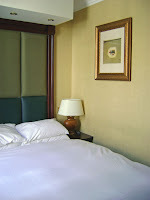 The rooms are small, very small, but perfectly formed. A nice bed (mattress too soft for my liking, but lovely light duvet on top), wardrobe with a safe, flat-screen television, hair-dryer, space for a small suitcase. The air-conditioning was efficient and the room felt cosy. And the soundproofing was good. The windows are single-glazed, so you do get some of the traffic noise, but the insulation between the rooms must be very good, as we didn't hear any of our neighbours. And a modern bathroom (I've seen smaller, I'm sure), with powerful shower with 2 heads - a big head in the ceiling and a smaller hand-held one (though, on the last morning, the water was way too hot), cute little sink and a loo where you can sit straight (I hate loos where you have to turn sideways because it's too close to the wall). And shower gel and shampoo bottles that I would have loved to take home with me, except we had no checked-in bags and I would have had to carry them in those little transparent plastic bags you have to use to get through airport security these days. Location was excellent - less than 10 minutes' walk from Paddington station, and about the same distance to Lancaster Gate tube station at the entrance to Kensington Gardens/Hyde Park. Easy walking distance through the park to Exhibition Road with the Victoria and Albert Museum, Science Museum etc (It's uphill on the way back though!). On our last day, we walked to Marble Arch and Oxford Street, and back - that was quite an easy walk. There are plenty of ethnic restaurants in the area. The Satay House was 2 minutes away. And Paddington station has plenty of breakfast alternatives (we didn't have breakfast included in our package), including 2 mini-supermarkets selling fruit salads and juices for those of us who can't take dairy or wheat products. I'm a big Boden fan. Since Rita gave me a loan of a Boden catalogue a couple of years ago, I've been a regular buyer on their website. Their clothes fit me (perfect size ten for top and bottom! ), the styles are casual enough for me, and quirky enough too. It's all pretty and feminine without being too fussy. You can put together whole outfits thanks to their recommendations (plus they tend to go for colour schemes, so everything goes with everything). And it saves me the headache of going shopping in town or Dundrum and not finding anything that I like. The only items that don't seem to work for me are coats - they tend to look very big on me, and their shape just doesn't work. So it was with delight that I realised there is a Boden shop in London! It was a bit out of the way, but with the Tube, everything is within easy reach. It was about half an hour from our hotel in Paddington, and it couldn't be easier to find, just like it says on the website: "Central Line - 400 yards towards central London from Hanger Lane tube station. Piccadilly Line - Next door to Park Royal tube station." Shopping Heaven - that's the only way to describe it. It's a compact enough shop, but it has more or less everything in the most common sizes. I tried on about 20 different things - the shop assistants take everything you pick up to the changing rooms and you can take in 8 pieces at a time. There was a comfy chair and a paper for Brendan just outside the changing rooms. There were a number of items I had seen in the catalogue and the website but that I wasn't sure about. Some were good, some not. By and large, it just confirmed my impressions from the website. I always read the bad reviews on the website - I find that's the best way to find out what the clothes are really like. But it's even better to be able to check out the actual colour, cut and fabric. In the end, I bought about 8 pieces and I was able to use the 15% discount voucher Lorna had given me (Thank You, Lorna! ), so saved myself a bit of money too. And the Sterling exchange rate helped too! All I need is a warm sunny summer to wear my pretty clothes! my poppy. 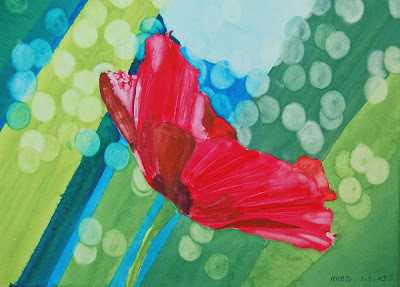 I won't be painting poppies for a while, just in case you're wondering. 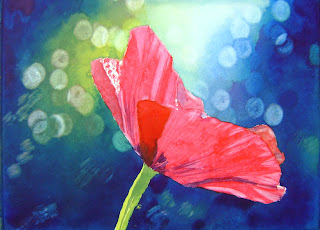 I did tell you I would be making another go at my watercolour poppy, didn't I? Here, I combined the techniques from my first 2 attempts, and I'm pretty happy with the result. While I'm talking food, I should mention this delicious Malaysian restaurant Brendan found near our hotel, in Paddington, Satay House. We wanted something near the hotel, so Brendan did the research and found Satay House just around the corner. We didn't have a reservation, and had to wait half an hour for a table. Thankfully, there were a few nice pubs nearby, all busy with an early-evening crowd. For starters, we had the traditional Satay, and the not-so-traditional Begedil. Well, we'd certainly never heard of it. It's a potato and lamb cake. Sounds heavy? It's not! It's the lightest and fluffiest potato cake I've ever had. With a simple chilli sauce, it was a gorgeous dish. For my main course, I had a Nasi Lemak, a rice dish with shrimp, egg, cucumber, peanuts and crunchy white bait anchovies. A perfect mix of textures. And the beauty for me is that it came all separate on the plate, and I had the pleasure of mixing it all up, a pleasure I could not resist! Very hot, but very tasty. I can't remember the name of Brendan's dish. It was a chicken in a hot chilli sauce - very very very hot. It was OK if you just stuck to the chicken, but it would have been too much for me. And then, as if we were not full enough, we had a Bubur Pulut Hitam, glutinous black rice pudding with coconut and sugar. Their version of rice pudding. Very comforting. There was a great buzz about the place, it being Paddy's day and all - or maybe not, as Malaysian families seemed to be flooding the place, along with British and Irish staff from the nearby hospital, a French couple, a couple of tourists, and a lone businessman, who could not separate from his Blackberry and his Financial Times, as he slurped his food. We don't get to eat Malaysian very often, as LangKawi near Waterloo Road is not what it used to be, so Satay House was an extra bonus for our mini-break. Well, while I'm writing about one Indian restaurant, I might as well mention others. I've been eating a lot of Indian lately. And I'm able to eat hotter food than I used to. 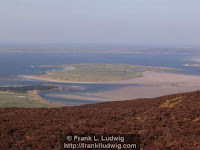 Last week, I met up with Berit and Susanne, and we ate in Konkan on Clanbrassil Street. It's not a fancy place, but the food was good, and the service very friendly. Then, the following day, Brendan and I decided to have a quick bite to eat in our good old reliable, Indian Summer. It didn't disappoint. I just wish they did a Sunday buffet! But prices in London were much lower than here, for a much higher-standard restaurant. The exchange rate helped of course, but you can't help feeling that things could be cheaper. We were in London last weekend, for a well-earned mini-break, 3 nights from Sunday to Wednesday. This was our first holiday since we were in Australia and New Zealand last year, and we made the most of it. On St Patrick's day, after a morning's shopping in Boden (more about this in another post), we had lunch in Malabar in Notting Hill. Brendan had done his research before we travelled and had read good reviews for this Indian restaurant hidden away at the back of the main street. The reviews were right. Malabar is a modern restaurant - all whites and grays, including the photographs on the walls, photographs of dunes and ancient observatories, beautiful abstract curves. One of the photographs was in orange and rust hues, and that was the only dash of colour in the whole place. Apart from the food, that is. All colourful and fiery. Of course, I can't remember what I had now, but I think anything on the menu would have been good. We had a side dish with aubergines I think (or was it pumpkins?) and it complemented our main courses perfectly. It was a Tuesday lunchtime, so I didn't expect crowds, but I was surprised to see only us and two ladies-who-lunch there (their husbands were "playing golf or at Cheltenham", or so they said to the maître d' - though I thought that Cheltenham was the previous week - They're obviously not keeping close tabs on their husbands). 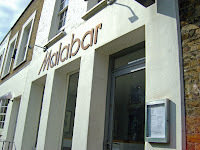 I hope Malabar gets the crowds in the evenings and other days of the week, as I certainly wouldn't mind going back there next time we're in London (and we don't go often. The last time was about 6 years ago). The meal was nicely finished by little colourful sweets (much smaller than tic tacs, in oranges, whites and yellows, a coating of sugar over an aniseed-flavoured seed, fennel if I remember correctly). Susanne and I went to the Abbey Theatre last night, to see Marble, a play by Marina Carr: 2 couples, 1 dream of passion and marble shared across the lines, cosy middle-class lives put into question, a break for freedom and for a meaningful life. It follows the classical principles of Irish plays: a happy first half, with plenty of humour, light-hearted relationships, and a dark second half, where it all crumbles and falls apart. The end was too abrupt - that's the only thing I didn't like about the play. The dialogs were on the clever side, but that's theatre for you. I'm more used to the realistic lines of TV series and movies. The play certainly took me in, and I felt for the women (more so than the men, who didn't feel as real), those well-to-do Irish women, intelligent and bored, stuck at home raising children, with nothing to give their lives meaning. Here is a link to a review that will tell you a bit more about it. Here is a link to a YouTube video of rehearsals of the dream ballet sequence in Madama Butterfly. It all looks so easy on stage! I went to 2 operas in the last 2 days - Mazeppa by Tchaikovsky, and Madama Butterfly by Puccini. The first did not do anything for me. The production was OK (though I cannot understand why they would want to move the timeline from Peter the Great's era to pre-revolution Russia), the singing was good, but I found Mazeppa heavy. Too many words and not enough melody for my taste. I think I'll stay away from Russian opera in future. Too serious for me, maybe. Well, life is too short to sit through an opera you don't enjoy - so I left at the interval. Thankfully, I had gone on my own, and I had bought a cheap ticket. The man beside whom I was sitting must have been wandering where I disappeared to! Madama Butterfly, on the other hand, was a joy. It was a Met HD live broadcast, showing at Movies@Dundrum. I had managed to get tickets for it just as they started selling them. It was completely sold out, filling Screen 1 and 4. The whole Met live broadcast is very polished, with a count-down 5 minutes before the start, and during the intervals, and interviews with the artists too. And you get good onstage close-ups, better than the best seat in the house. This Madama Butterfly was a production by Anthony Minghella (The English Patient) and it was excellent- very modern (not like most Met productions, which can be a tad old-fashioned), with good use of light and very simple props (and, of course, Japanese paper screens). The singing was glorious (apart from Pinkerton's American wife, who had a much weaker voice than the rest of the singers, but it didn't really matter, as she only has a line or two to sing). Patricia Racette was Butterfly, Marcello Giordani - Pinkerton, Maria Zifchak - Suzuki, Dwayne Croft - Sharpless the American Consul were all excellent - good voices and genuine acting skills. Everything worked towards a successful production: not only the singing, and the lighting, but also the acting, the costumes, the dancing, and of course, the puppets. Altogether, a very memorable opera. I'm glad I brought Brendan along. At €7 per ticket, a real treat. We've finally left Total Fitness and signed up with WestWood gym. While the overall layout of the gym is far brighter and nicer in Total Fitness Sandyford, and they have a gorgeous pool area, we were fed up with squeaky and non-working machines, blocked emergency exits, and non-working hair-dryers. I pointed out the problem with the emergency exit to the manager months ago and he never did anything about it. They had decided to put in sofas and flowing net curtains in that area - you can imagine how that would work out in the case of a fire! So, when we got a 4-day pass from WestWood in Leopardstown, we decided to give it a go. It's not as luxurious as I was expecting it to be, and the cardio machines are packed in very tight. But it seems to be well managed. I saw a woman with a clipboard trying every single cross-trainer on Friday, and there was a man repairing some of the machines, while another one was cleaning them! And the other day, a woman complained to the cleaning lady that a hair-dryer was getting very hot. The cleaning lady took the hair-dryer away and came back with another one 5 minutes later! There is a big quiet and warm room for stretches, with mats, gym balls and other bits and pieces. And they have dimmed lights in there, so you're not blinded when you're lying on your back. 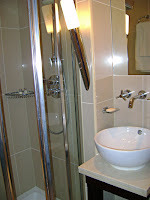 The changing rooms are comfortable, and the showers are a good temperature. No soap or shampoo in their dispensers yet, though. They are currently doing renovations, and there are builders around the place, but they seem to be making good progress. We haven't been out the pool area very much yet. The main pool is only for lane swimming, and the jacuzzi was too hot when we tried it, but they have a lovely caldarium, which I must go to again. Since we moved in mid-February, we've gone 3 times a week, which I think is perfect, and last week, I even went a 4th time. I think my bum and thighs are definitely firming up! I need to do a bit more work on the arms, though. Mary gave me a loan of a book a couple of years ago - Brick Lane, the story of a young Bangladeshi woman married to an older man in England, and how her life works out in London. It was a good story, a book I enjoyed reading - there was a lot of sadness in it, but also a lot of strength and love. So, when Brendan taped the movie on the telly a few weeks back (we have NTL digital with a recorder machine - very handy), I was delighted to have it to watch at my leisure! The movie goes back and forth more than the book, with Nazneem retreating into happy memories of her childhood whenever she finds her life in England too hard to take, but it works, and I found it was quite a faithful adaptation of the book. It didn't show as much of Nazneem's sister's life as the book. So I felt it lacked the contrast of the 2 very different lives, and how, after all, Nazneem is lucky in her life in England, despite her longing for home. Her husband, if a bit of a fool, is a kind man, and he loves her in his own way. And the saris she wears throughout are just gorgeous. I would watch it again just to see those beautiful colourful fabrics. I've just finished reading The Secret Scripture by Sebastian Barry. It's not perfect - the major flaw is that it all ties in too neatly in the end-, but the first 75% of the book is compelling reading. The main character, Roseanne Clear, tells us her life, and how she ended up in a mental institution. In parallel, Dr Grene, her psychiatrist, keeps a diary of his conversations with Roseanne and of his relationship (or lack thereof) with his wife. He is somewhat distracted by events (I won't say too much), and doesn't seem to be a very focused doctor. I found I wasn't that interested in his side of the story, but I found Roseanne's voice very human, and I was very taken by her story and how she tells it. I have a great social life these days - I was out on Friday night with a few neighbours and we went for a meal with Niall and Rita on Saturday night. Both nights were great. Really enjoyed them. On Friday, we went to the China Sichuan in Sandyford Industrial Estate, and on Saturday to Gong in Stillorgan. I guess this is the perfect opportunity to compare the two. Decor-wise, China Sichuan wins hands down. The new restaurant, while in a strange location (across from the Luas in Sandyford Industrial Estate, at the back of Microsoft), was purpose-built. It has two large dining rooms, decorated very tastefully. There is a hint of the orient, but very subtle. The lighting is warm. It feels very welcoming. Gong, on the other hand, with its choice of red and black, feels quite cold. Service was good in both places, though I have to say that the Eastern European waiter in China Sichuan was more polished than the Chinese waitress in Gong. I had had that Eastern European waiter before, and I had not been impressed, as he had been too chatty and informal with customers. But he seemed to have cleaned up his act, and he looked after us well, very professionally - he went through the various specials in quite a bit of detail, and, when we asked him to give us a choice of starters, he made sure there were a couple of wheat-free options for me. And for my main course, he made sure that the soy sauce was gluten-free, which he confirmed when he brought the dish over. That said, none of us got sick after eating at Gong, so the food must have been gluten-free. Food-wise, I enjoyed both (once I realised that those little dark red bits in Gong's Prawn with Ginger, Scallion & Chillies were the chillies, and very hot ones at that! And here I was wondering why my mouth was burning!). Gong have a lot of the staples from the old China Sichuan (including one of their main waiters, by the way). But China Sichuan have new and interesting dishes, especially if you try out the specials. Price-wise, I think Gong offers better value, but our bill at the China Sichuan on Friday night was less than I had anticipated. Apparently, China Sichuan offer a very good lunch (starter & main course) for €16, so a good way to try it out without breaking the bank. My verdict: for a special night out, China Sichuan offers better atmosphere, but I'm not sure I'd go there on a Monday night for an easy family meal out. Gong is up and coming and one to watch. By the way, they seem to have dropped the Korean part of their menu. I guess Ireland is not quite ready for a Korean restaurant (I know I'm not!). This is my 2nd attempt at this poppy, and possibly not the last. I decided to try out something completely different, with bands of bright colours as a background (some lovely greens), and little circles of light. I think the poppy itself is better than the first one, but the background doesn't contrast enough, and it feels flat. So I'm thinking of doing a third one, with better tonal values. I like my little circles of light, and I think they would look good with a darker background. I lifted the colour with a damp brush and paper, using an ellipse template I got ages ago (I should have got a circle template too. Maybe I did and I can't remember it. After all I didn't remember I had the ellipse template. I must go rummage in my art materials press to see if I can find it). The one thing to check with a dark background is that the colour I choose is not too staining, or it won't lift properly. It was cool today, but there was plenty of sunshine, so we went for a walk on the South Wall. It was very windy, and I was glad of my wooly hat to keep my ears warm. But there was good heat in the sun, and it felt good.